Not many American cigar lovers found it an occasion to celebrate, but last week marked the 50th anniversary of John F. Kennedy’s Proclamation 3447 and the U.S. trade embargo of Cuba. Since February 7, 1962, Americans have either had to seek out Non-Cuban substitutes for their inimitable Cuban favorites or to skirt the law and risk possible legal sanctions. Many of us — and I won’t say who — have done both. Whatever your political viewpoint — and there are as many points for as there are against the embargo — a positive consequence of the ban has been the development of cigar industries in the Dominican Republic and Nicaragua that now rival that of Cuba’s. And this has been a huge boon for cigar lovers everywhere. The “forbidden fruit” factor has always been an element at play in the blending and marketing of cigars to Americans, but to a certain extent this has faded with the introduction of super premiums from Fuente, Padron, Tatuaje, Davidoff, and many others. But the elusive flavor of Cuban tobacco is never far from our minds. And every once in a while a cigar comes along that gets very close to that flavor. I think Jameson has done that with Santos de Miami. 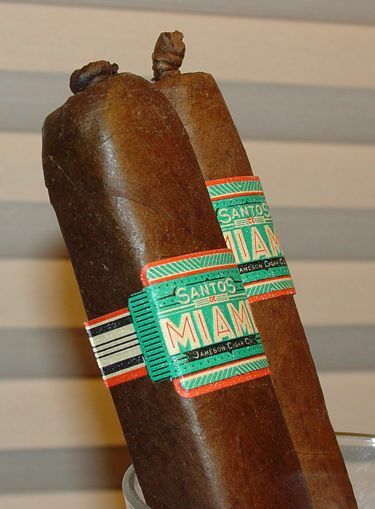 Jameson’s Santos de Miami cigar is already distinctive with its box press and art deco band — add a pig tail cap and the distinction is complete. The claro wrapper shows some fine veins, but is otherwise clean. The draw is excellent, and the burn is only a little off kilter. This seems to be standard with box-pressed cigars, but in this case the uneven burn was a minor issue and corrected itself over time. The ash was solid, smooth, and delightfully quadrilateral. The Haven and the Alma sizes smoke like very different cigars, though they share the same musky, earthy and Cubanesque aroma. The corona-sized Alma is a sharper, somewhat bolder smoke. It fires up with a pinch of cayenne pepper in the sinuses and then quickly evens out to a smoother but still full-flavored profile of cedar and musk. 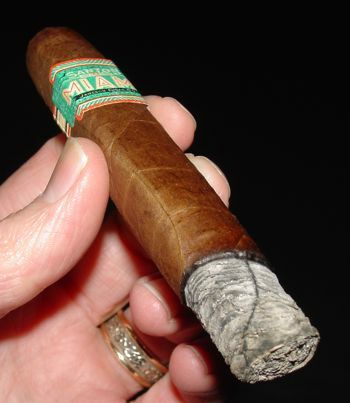 The Alma burns with a little more passion, but is also less complex than the larger vitola. 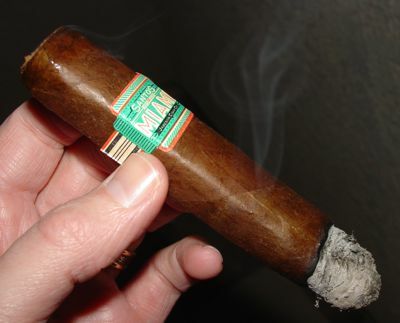 The toro-sized Haven is much less peppery and leans on the musk and cedar more heavily than the smaller cigar. The smoke texture is just as creamy smooth though, and it seems to have an additional bass note that the Alma lacks. The middle section is earthy with a sweet cedar edge, and the final third rests on its woody foundation while the earthy flavors take a back seat. What both sizes have in common is an earthy and musky scent with a cedar note. I’m certainly no expert when it comes to Cuban cigars, but this aroma is really close to what I’ve found in many standard line Habanos. The scent is not quite as delicate, but I find it to be very similar. In any case the aroma complements the sharper character of the Alma just as well as the more complex flavors of the Haven. 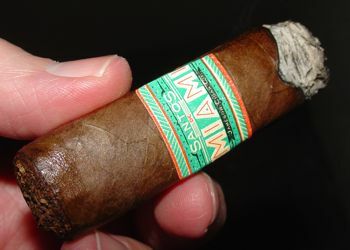 Santos de Miami is not an easy cigar to find, but truly “boutique” cigars generally aren’t. This is one worth seeking out if your tastes run to earthy and medium-bodied Cuban-style smokes. At least you won’t have to get them from a guy who knows a guy and end up with cigars of mysterious provenance. The retail price for the Alma is around 7 USD and the Haven sells for 8. They are available from a few online outlets, but you might as well go straight to the source at Jamesoncigars.com. Pick up a pound of Rockstone coffee while you’re at it and let me know how it is. Great price for a boutique cigar, at that price point I’d try one out for sure. Interesting cigar. Ok to be honost i love box pressed cigar more than anything else. Have seen it with online retailer but didnt look at it because i didnt find anything on the web. Now it is officially on the top of my list. cigarpalace – Although Jameson only ships to U.S. addresses, I have seen these offered at a few places that ship internationally: Charmed Leaf, East Coast Cigars, and Famous Smoke Shop. There are probably others.